Senator Mensch was honored to host the Senate Guest Chaplain, Pastor Peter Smith, on October 24th. Pastor Smith was joined by his son Nick and Elder Stephen Curley. You can listen to the prayer and their introduction to the Senate here. Veterans are invited to attend my annual Veterans Appreciation Breakfast which will be held on Saturday, November 12, 2016. Doors open at 7:45 a.m. for check-in and the event will take place from 8:30 a.m. -10:45 a.m. at the Upper Perkiomen High School, located at Two Walt Road, Pennsburg, PA 18073. The event will feature special guest speaker Brigadier General (Retired) Jerry G. Beck Jr., Deputy Adjutant General – Veterans Affairs with the Pennsylvania Department of Military and Veterans Affairs. Veterans must register themselves and up to one guest by Monday, November 7. Veterans can register by calling 215-541-2388 or by completing the registration form online at http://www.senatormensch.com/veterans-appreciation-breakfast/. Montgomery County and Bucks County residents can bring their license and a copy of their DD214 to receive a Veterans Photo ID card which enables them to access discounts from businesses in their respective counties. Berks County residents can obtain information on how to obtain a Veteran Photo ID card from the Berks County Recorder of Deeds by calling their office directly. In addition, the Pennsylvania Department of Military and Veterans Affairs will have their mobile services van and personnel to help answer questions pertaining to state veteran benefits and programs. 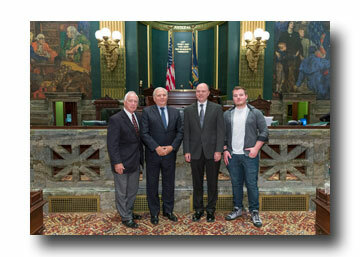 Senator Mensch met with constituents from Tabor Children's Services Inc. (located in Doylestown, PA) during their visit to Harrisburg. 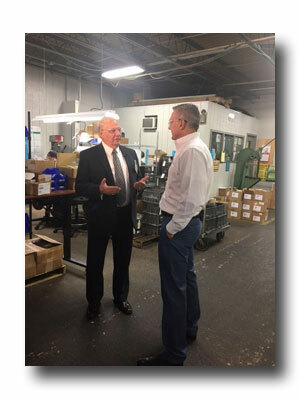 On this edition of the Mensch Report, I visited Bracalente Manufacturing Group in the 24th Senatorial District. 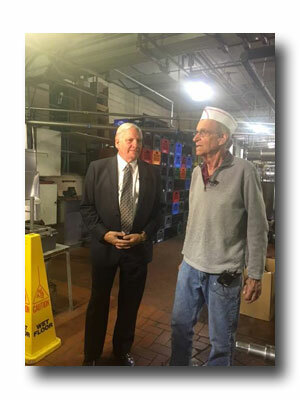 The tour was held on “Manufacturing Day” which brings awareness to manufacturing businesses and jobs in Pennsylvania. 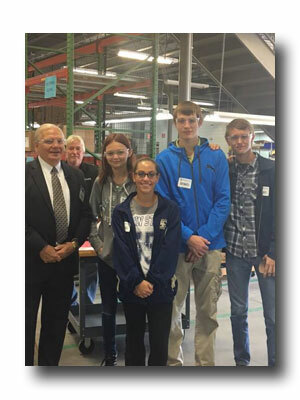 Bracalente invited students to their facility and provided an opportunity for them to learn more about careers in manufacturing. Watch the show here. 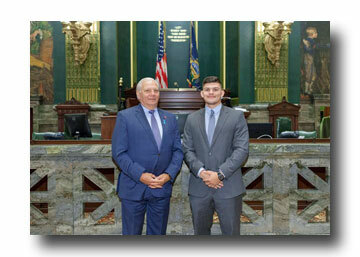 Robert Rein, district intern for State Senator Bob Mensch, visited Harrisburg on October 18. Robert is a senior at Ursinus College and is majoring in Political Science with a double minor in Economics and International Relations. He is also President of the Ursinus College Student Government and is a member of the Ursinus Wrestling team. You can view his full introduction here. On October 14, I held my annual Senator for a Day seminar at The Perkiomen School located in Pennsburg, PA. The seminar allowed high school students from the 24th Senatorial District to role play as a State Senator in a mock legislative session. Students selected a committee based on their area of interest and debated and discussed the mock legislation that had been presented to them. Various lobbyists and legislative staff were on hand to guide the students through the committee process and assist them as needed. After the students discussed the legislation in their committees, a general session commenced, at which time all students voted on all of the legislation voted out of committee. High school students from Brandywine Heights, North Penn, Pottsgrove, Quakertown Community, Souderton, Upper Perkiomen, and the Perkiomen School attended the event, resulting in an impressive turnout of almost 100 students. Footage of the event will be made available on my website at www.senatormensch.com in the coming weeks. 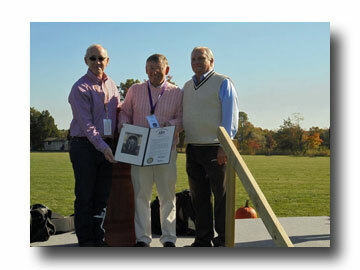 Senator Mensch presented Upper Salford Township with a citation honoring their 275th anniversary. If you are unfamiliar with the Spotted Lanternfly, it is an invasive species native to China, India and Vietnam and was first discovered in Berks County in September 2014. The insect has the potential to destroy high-value crops including grapes, tree fruits and hardwood lumber. Early detection is vital to the effective control of this pest and the protection of PA agriculture and natural resources-related businesses. Spotted lanternflies have been found in wooded areas and residential landscapes, especially where there are tree-of-heaven (Ailanthus altissima) trees. Intentional movement of any of the life stages of the Spotted Lanternfly is prohibited. The quarantine order, which has been supported by the affected communities, means that any item that could hold any life stage of this insect may not be moved outside the quarantined area without inspection and compliance. That includes firewood, vehicles, outdoor household items and any items stored outside during the fall, as well as building materials and plants or plant parts. Additional information on the quarantine can be found on the Department’s website. The Pennsylvania Department of Agriculture has created a calendar contest for children in order to bring greater awareness to the spotted lanternfly issue and prevent the spread of the species. The purpose of this contest is to educate students and their families about the importance of inspecting items prior to leaving the quarantine area. Children in first through sixth grade can prepare an 11” x 17” poster using a combination of mediums and art elements such as crayon, paint, acrylics, watercolor, markers, etc. Their artwork must reflect the theme “Look Before You Leave.” Each division winner will receive a prize and their artwork will appear on a page in the 2017 Spotted Lanternfly Awareness Calendar. View the contest rules here. You can access the submission form here. 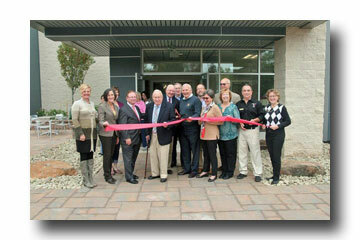 Senator Mensch was pleased to attend the grand opening at North Penn Commons. The Pennsylvania ABLE Act was enacted in April 2016 to provide people with disabilities and their families with a way to plan for a financially secure future without affecting government benefits. The Pennsylvania Treasury has been working diligently on implementation and plans to offer the PA ABLE Savings Program for enrollment in December 2016. In order to offer a high-quality ABLE program at lower costs, Treasury helped create a consortium of ten other states that are pooling their resources to offer individual state plans with common elements thereby creating economics of scale much more quickly. May be used to pay for a wide range of disability expenses including basic living, housing, education, health, legal, transportation and more. You can sign up to receive updates and register for enrollment material by visiting www.paable.gov. 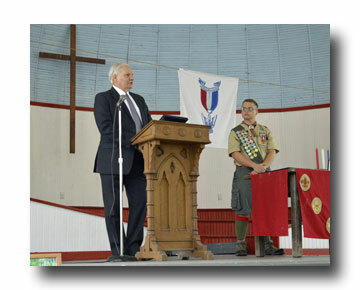 Senator Mensch was honored to attend the Eagle Scout Court of Honor Ceremony for Brendan Davis. The Low-Income Home Energy Assistance Program, also known as LIHEAP, helps low-income families pay their heating bills. LIHEAP is a grant that offers assistance in the form of a cash grant, sent directly to the utility company, or a crisis grant for households in immediate danger of being without heat . The LIHEAP program opens on November 1, 2016. Applications will be available at my district offices in the near future. Until then, you can access the application by visiting http://www.dhs.pa.gov/citizens/heatingassistanceliheap/. In addition to the LIHEAP cash program, households experiencing a heating crisis may be eligible for additional benefits through the LIHEAP crisis program. The Crisis program will reopen in the Fall of 2016. Assistance with home heating crisis situations will be available 24 hours a day; in most counties, you should contact your local county assistance office. The Bucks County Drug and Alcohol Commission, Inc. (BCDAC, Inc.) provides prevention, education, intervention and treatment for Bucks County Residents experiencing addition to alcohol, tobacco, heroin, prescription drugs, and other narcotics. They contract with more than 30 agencies to provide prevention and treatment services. In addition, they supply overdose prevention resources, parent/child programs, and much more. To learn more about BCDAC, Inc.’s services, drug take-back programs, click here. Motorist must still come to a complete stop under Pennsylvania’s new red light law, Act 101 of 2016, according to the PA Department of Transportation. The measure, deemed Ride on Red is intended to provide a legal option when motorcycles, small cars, and other vehicles fail to trip the sensors at a red light. Motorists may then proceed with caution only AFTER coming to a complete stop to comply with the legal requirements of the new red light law. Pennsylvania Vehicle Code, Title 75 subsection 3112, (c) (2), now requires treating a malfunctioning red light as one would a stop sign. The measure is intended to solve a practical problem while ensuring traffic safety. With the fall planting season still in full swing, Agriculture Secretary Russell C. Redding reminds producers to understand their obligations when it comes to marketing seed. Selling seed in the state is regulated by the Act 164 of 2005, the Pennsylvania Seed Act. Seed distributors, the person or company whose name appears on the label, are required by law to obtain a $25 annual seed license from the Pennsylvania Department of Agriculture. Licenses must be renewed annually. Distributors must abide by the rules and regulations established to ensure the sale of quality seed that can be depended on to perform as labeled. State law requires seed labels that contain critical information, including the complete name and address of the labeler, lot number, purity analysis, germination percentage, and the month and year in which the germination test was completed. The label must appear legibly, in English, in an easily visible place on the outside of the container. Planting unlabeled seeds poses multiple risks for producers and for the state’s ecosystem, including reduced seedling establishment through lower germination rates and an overall lack of purity needed to produce a crop that can meet their production needs. Unlabeled seeds can introduce difficult-to-control weeds that the department lists as prohibited and restricted noxious weeds, as well as invasive weeds like Palmer Amaranth and Water Hemp. From July 2015 through June 2016, the Pennsylvania Seed Laboratory received more than 6,500 seed samples that required more than 7,000 separate tests to assess the quality of the seeds. The lab tests a wide range of seeds including flower, vegetable, tree, agricultural, feed, pasture and lawn mixes from samples collected by state inspectors, in addition to those submitted by farmers and wholesale seed distributors. For more information on the Seed Act and its regulations, visit www.agriculture.pa.gov and search “seed,” or call 717-787-4894. 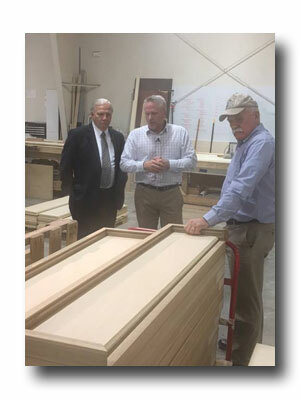 On Manufacturing Day, October 7, Senator Mensch toured Bracalente Manufacturing Group, Artisan Display, Inc., and Longacre’s Dairy. 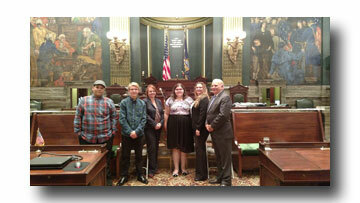 In addition, he spoke with students visiting Bracalente to highlight the importance of manufacturing in Pennsylvania. The online 2016 PA Student Aid Guide enables students and families to chart a course for higher education unencumbered by unnecessary student loan debt, according to the Pennsylvania Higher Education Assistance Agency. Hard copies are also available through local high schools and libraries. Students and families can now complete and submit the Free Application for Federal Student Aid rather than waiting to apply after January 1 for admission during the 2017-18 school year. More than $6 billion in road maintenance and construction projects across the Commonwealth are capped off with line painting, according to the Pennsylvania Department of Transportation. Avoid passing paint trucks which pull over periodically to let traffic pass. More than 110,000 miles of traffic line painting begun during the spring and summer, will continue through this fall. Consult the 511PA “Travel Info to Go” map by clicking the empty box between the word “Construction” and the traffic cone symbol above the map. Clicking on the traffic cone symbol will then reveal construction details allowing you to tailor your trip, as necessary, to the roadwork ahead.